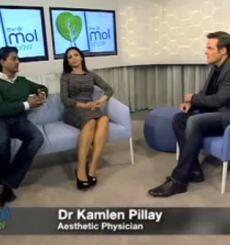 This July, Doctor Kamlen Pillay guest featured on the Dr Mol Show, not once, but TWICE. The first feature is all about aging gracefully and remaining healthy. Dr Kamlen Pillay reveals all the things we should be doing to combat the ageing process and preserve the youth of our bodies. The second feature focuses on youth preservation and stem cells, an area that is capturing a lot of attention in recent years.